When she was a child, Lexie Van Den Heuvel was diagnosed Celiac disease, a genetic autoimmune disease where eating gluten can damage the small intestine. As she grew older, Lexie noticed that not only is gluten-free food roughly three times more expensive than comparable gluten-based food, but the cost to test for Celiac is so great that most children go undiagnosed. Moreover, once a diagnosis is made, there is a lack of education and awareness about the diet changes that must go into effect immediately to stave off further health issues like migraines, infertility, early-onset osteoporosis, and cancer. Especially concerning to Lexie were the effects Celiac disease had on low-income families in her community. She realized there were no national, state or local programs to help low-income families with food allergies and intolerances. At the age of 14, Lexie founded Cutting Costs for Celiacs, a foundation to help Celiac-affected children in Wisconsin overcome a variety of health care disparities. The foundation donates gift baskets to newly diagnosed patients that are filled with gluten-free products, coupons, recipes, and lists of gluten-free bakeries, restaurants, and grocery stores. To date, the foundation has donated more than 1,000 pounds of food. Cutting Costs for Celiacs also sends $50 in gift cards to low-income families so they can purchase their own gluten-free products and distributes a coupon e-newsletter to help reduce the financial burden of a gluten-free diet. Additionally, Lexie’s foundation is raising awareness of the disease through educational videos, social media, and presence in the schools, doctors’ offices, and the community. 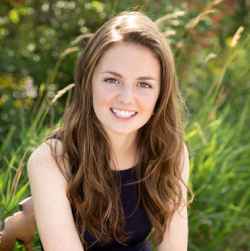 Due in part to the Hawkinson Foundation Scholarship, Lexie will maintain her foundation and start her freshman year at the University of Notre Dame, pursuing social entrepreneurship studies in the Mendoza College of Business. Lexie values community activism and was drawn to this school because 80% of its students are involved in community service.